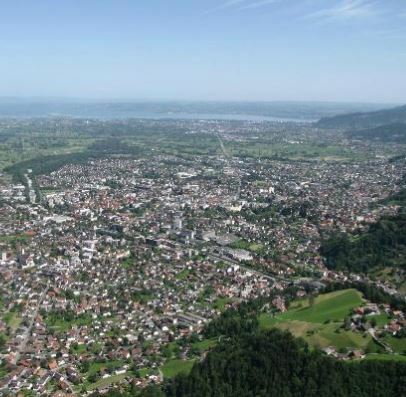 Karren Dornbirn is the mountain of Dornbirn and can be reached within 15 minutes via the motorway from Bregenz. Compared to the Pfänder, the Karren has the advantage of smaller numbers of tourists and a much better restaurant. There is also one of the most interesting scenic gorges and a Rolls Royce museum for car enthusiasts. From the valley station at 464 metres above sea level, the route climbs up to 976 metres above sea level – and then up by cable car! The cable car in Dornbirn is a popular destination in Vorarlberg and the Lake Constance region. 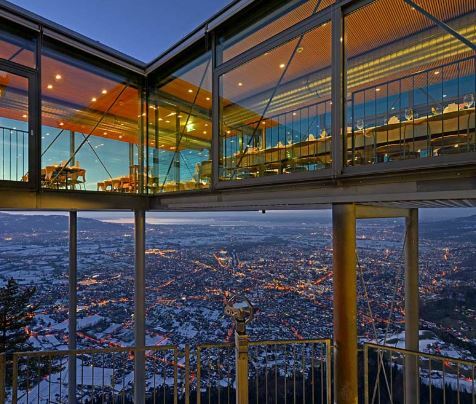 The Karren offers fantastic views over the Rhine Valley – even in the evening when the sea of lights glistens deep down. The Karren Dornbirn is a popular meeting place in the region. 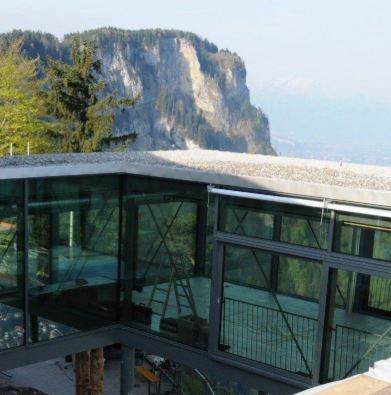 On the one hand, beautiful hiking trails have their starting point here, on the other hand it is wonderful to enjoy the local specialities in the panorama restaurant at 976 metres. Whether you want to go out for a bite to eat or just get a taste of the mountain air: In five minutes, the cable car takes you high above the roofs of the city and Vorarlberg and offers you a wonderful view: the entire border triangle by day, the sea of lights by night. 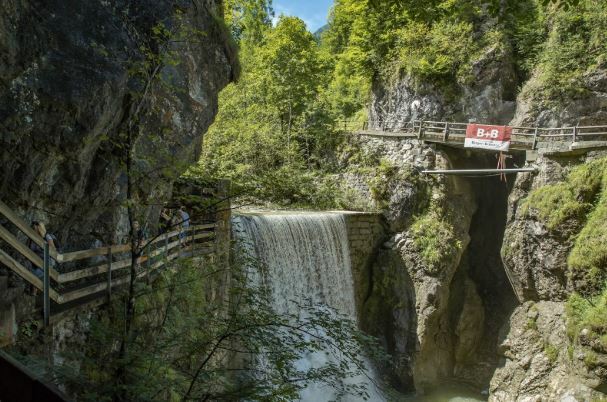 Another beautiful sightseeing destination is the Rappenlochschlucht (Rappenloch Canyon), a short 1 hour trip is a good idea before taking the cable car to the cart. 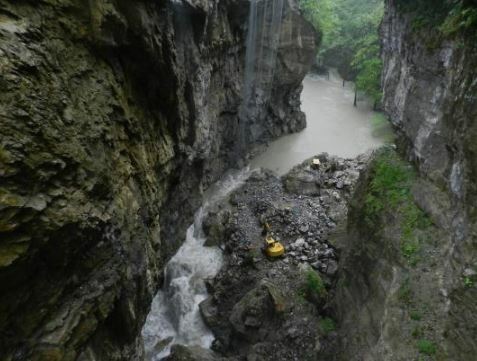 It is one of the largest canyons in Central Europe. From the entrance of the canyon to the ascent to the platform it only takes about 30 minutes. My tip, come here when it rains. The gorge then offers a wonderful mix of waterfalls with the corresponding acoustic noise. At the entrance to the canyon is also the Rolls-Royce Museum. It is a private collection owned by the Vonier family and made accessible to the public. 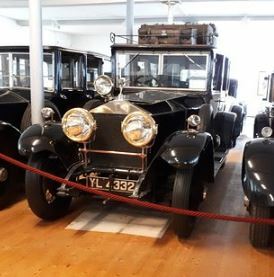 In Europe, it is one of the most interesting museums of its kind, with selected exhibits such as the Queen’s automobile and Francos Rolls Royce. It is also possible to dine in the museum. A few years ago I organized a business lunch here. The owners offer a good mix of great food, knowledge, guided tours and enough privacy for small talk. Events of this kind have to be requested and booked in advance. 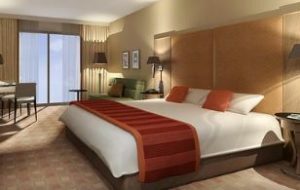 If you want to see all three attractions, it is best to park your car first in the parking lot to the canyon and the museum and then drive a short distance back to the parking lot of the cable car station.